State and local regulations vary by state. As you are using insects as food, follow all of the regulations that govern food production. An overview can be found on the FDA website. On a Federal level, insects used as food fall under FDA oversight. The USDA’s Food and Safety Inspection Service (FSIS) regulates meat, poultry and eggs. Everything else defaults to FDA regulation. FDA regulates sea food (which is most similar to insects …think shrimp and soft shell crab) and even covers game such as venison. The USDA may be involved in insect farming through their Animal and Plant Health Inspection Service (APHIS) agency. For example, if you want to import a new species that is not currently in the US, you would need to contact APHIS. Insects aren’t mention in regulations except in the Food Defect Action Levels. Insects are an unavoidable defect is some agricultural products such as tomatoes. Limits are set as to how much is allowed. However, this context does not apply when insects are purposefully added as a food ingredient. My recommendation is to use the FDA-Seafood guidance documents for insects to ensure that wholesome food is being produced. The FDA has specific regulations for seafood because they are relatively high risk food products. Lobster, crab and shrimp are regulated by FDA-Seafood. Grasshoppers are the shrimp of the land. Choking Hazard: Arthropods can have long legs that can potentially be a choking hazard. A lot of common foods are choking hazards like hot dogs and popcorn so don’t blow this out of proportion. Bay leaves are a hazard because then can cause splintering and cuts when consumed whole/crushed. Ensure that the particle size is sufficiently small in cricket flour. For whole crickets and grasshoppers, evaluate your supply to on the rigidity and hardness of the exoskeleton. Young cricket exoskeleton is still soft. Most dried crickets fracture and crumble easily and don’t pose a risk. Pathogens: Microbiological food safety will be something your company will need to address as you go from start up to and sustainable food business. Its common practice for established food companies to monitor and control yeast, bacteria and fungi. Startups can accept a lot more risk in this area. Companies that purchase cricket flour can leverage their supplier for microbiological information. A baseline measurement is Arobic Plate Count (APC) which indicates the total amount of bacteria present. The logic is that if there are a lot of total bacteria, it is more likely that there will be bad bacteria. For raw crickets, a producer can measure for the presence of pathogens as part of their quality control program. As pathogen testing requires resources, an alternative is to recommend safe handling procedures for raw insects. This is the practice for raw red meat and poultry. More info at Micro Standards Link. Environmental Hazards: These are best controlled for via farming. Good feed in will result in good food out. Post-harvest analysis for wild caught can be performed by outside labs such as Certified Laboratories who specialized in doing safety analyses. Keep in mind there may be some unforeseen issues such as anti-nutrients, side-effects from high chitin consumption and inherent toxic chemicals. How can you legally use insects in food? The “common sense” approach: People have been eating insects for the past 10,000 years. 2 billion people around the world currently consume insects as part of their diet. They are already in our food coming from unavoidable defects. Here is a summary of people eating insects without ill effects. Of course they are safe. The “I have done my homework” approach: We have assessed the safety of using insects as food. The insects are farmed for human consumption and produced using the attached HACCP plan. The product is free from hazards. Here is the most current research on the safety of using insects as food. The “GRAS determination” approach: This approach is best executed using help from a firm that specializes in GRAS determinations. They use scientific evidence to show that they are safe. The end result is a GRAS dossier the meets the legal requirements for a GRAS determination. The first two approaches would not pass the scrutiny of FDA review. However, because the edible insect industry is very small and that evidence is lacking showing that insects are harmful, it is unlikely that the FDA will prevent companies from producing entomophagy products. 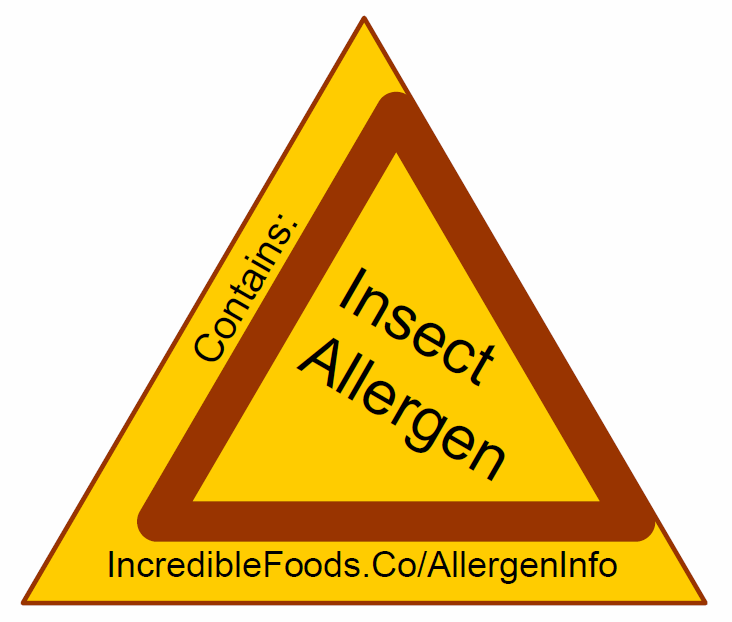 Are insects a food allergen? What do you need to do to protect your company? Manufacturers that use insects need to have a safety dossier available upon regulatory inspection. Even if it’s not that thorough, something is better than nothing and it shows that you have given it some thought. Follow regulations and best practices that apply to all food products. Include arguments in the dossier that support a GRAS determination. Have documentation and records showing that good, wholesome foods are being produced. Insects are “new” to our food supply and carry some unknowns about regulation, safety and market growth. It is ultimately a business decision to determine how best to mitigate those risks and grow a new industry. This entry was posted in Regulations and tagged Business, edible insects, Farming, fda, Food Safety, GRAS, Regulations on February 22, 2015 by Bob. 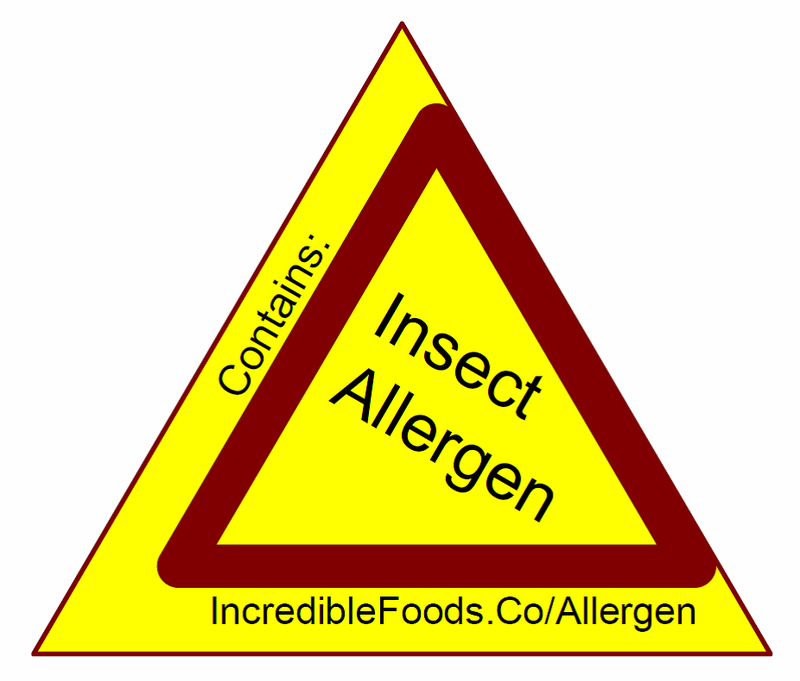 Potential insect allergens may cause the FDA to disagree with a GRAS determination. This premise means that an ingredient being added to food that is an allergen, like whey protein concentrate, would not be allowed. How is whey powder allowed as a food ingredient? I feel like I am missing part of the puzzle. But let’s not get into this for now. There are a lot of food products that contain potentially fatal allergens. Regulators feel the danger is well managed by requiring allergen containing products to state that they contain allergens. The allergens that cause reactions are also well known to consumers. A person with a milk allergen knows that they can’t consume dairy products and they know to look at the ingredients and/or allergen statement to find out if the food is OK. We don’t have this luxury for insects. People don’t know that insects can cause a reaction and they don’t know if they will be affected if they eat insects. Im making the assumption that some people are allergic to insects. Not all insects may be allergenic. Very few people may be allergic but we just don’t know. Protein sequencing can determine if proteins present in crickets, for example, are known allergens. The Food Allergy Research and Resource Program has an online database and other resources. While the technical information may be helpful, for now, a practical approach to addressing the issue is needed. Proposal for Insect Allergen Communication. Whether insects are being added to processed foods, sold as an agricultural product or used in restaurant dishes; a common platform for communicating the allergen risk can benefit entomophagy. Can be used on product packaging, posters and more. What allergens are in insects? Who may be affected by insect allergens? How do I find out if I am allergic? I don’t think we need to take these step yet. A strong warning may scare people from trying insects for the first time. However, this approach is an option to prevent regulator objection. This option could also be presented if and when any regulatory bodies object. Take a look at how the FDA addressed Added Caffeine in Gum. A potentially dangerous food ingredient (caffeine) was added to a food where it is not normally present (gum). A regulatory objection will probably start as a negotiation and not a new law. This entry was posted in Business, Regulations and tagged Crickets, Food Allergen, Food Safety on April 7, 2014 by Bob. 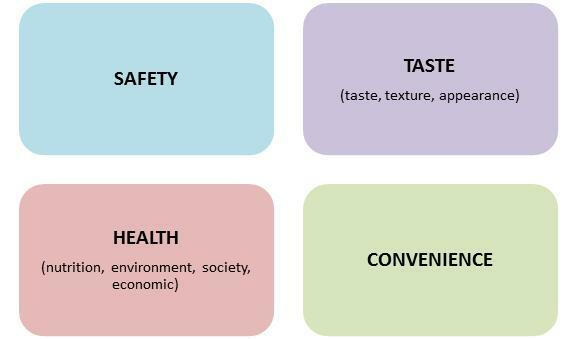 Safety, convenience, taste and health are intrinsic quality factors that affect food choices. Let’s take a closer look at these factors and see how edible insects score. Safety – Unglamorous but the most important factor. Safety hazard examples include pathogens (E. coli), heavy metals (mercury) and pesticide residues. If a food product doesn’t meet basic safety requirements, it won’t ever make it into your kitchen. When comparing food choices, safety is not a point of differentiation because most safety risks have been eliminated for the consumer by using good manufacturing practices and processing. Wild harvested insects are not recommended for consumption because there is a risk that they may have picked up pesticide residue along their travels. Convenience – Often taken for granted, convenience varies widely. Taste – This is the space where most of the competition takes place. After all, taste is king. If someone doesn’t like the taste of a food, they are not going to eat it again. Taste is usually a tradeoff between other factors. 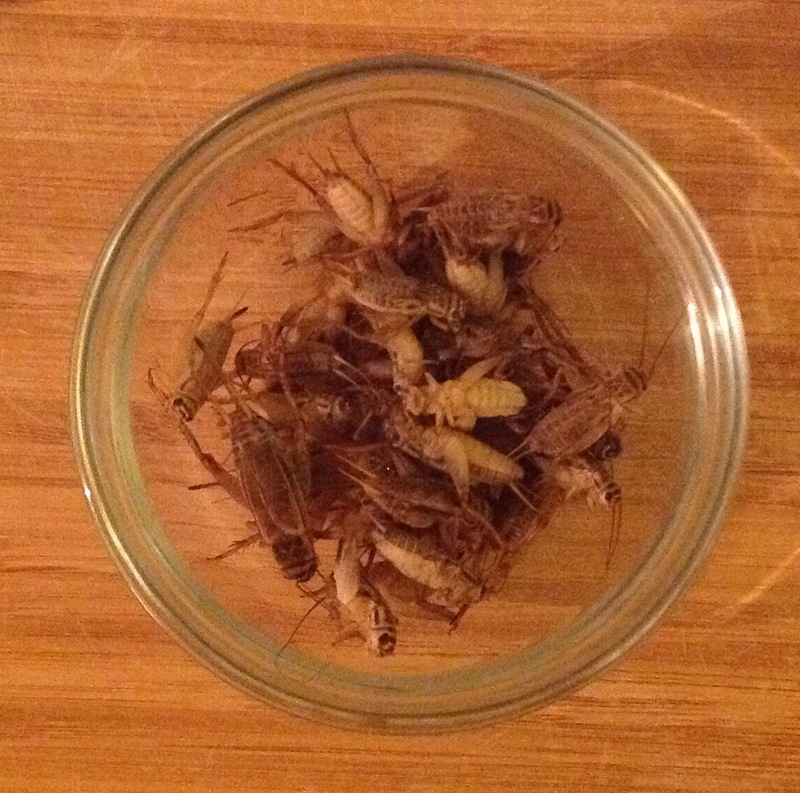 Canned crickets are more convenient than frozen but the taste and texture is probably better in frozen crickets. Crickets are visually striking which does not earn them any points. People generally don’t like the idea of an insect looking back at you when you are about to eat it. Turning crickets into a flour is an excellent way to by-pass this issue. If poached or fried insects are being prepared… chop them up. Health – Based on large food company behavior, health only has one category, nutrition. America’s food system is not doing an adequate job addressing socio-economic costs. Brands are quick to tell you how much fiber is in their product but they don’t tell you if it’s GMO fiber or if it’s highly processed fiber. It doesn’t help that individual consumers are not aware that their food choices also have far reaching environmental, social and economic influences. Health is why people should stop eating feed lot beef. Insects get 5 stars for health. Are insects ready for the masses? Even though people who practice entomophagy feel that insects are safe to eat, the average person may not be so confident. When communicating about edible insects, safety should be addressed by stating that insects, that are produced using GMPs, are safe to eat. Safety will probably become a non-issue as people become aware that insects are tasty and good for you. Taste and convenience is where our food system does an excellent job at creating craveable and easy to prepare food. Just about every store sells cold soda. There is tremendous opportunity for innovation in these area. Insects can be prepared in a variety of ways and different species offer unique tastes and textures. Literature often sites that insects taste excellent and are considered delicacies. We just have to find the right presentation for the American palate. For health, the preferred way to raise insects is through regional farming operations. We need to be mindful when sourcing insects so that they are not raised on chicken meal and preferably not sourced internationally. I think insects are ready. This entry was posted in Product Development and tagged Food Safety, Health, insects, Quality on March 4, 2014 by Bob. Generally Recognized As Safe (GRAS) is a food substance designation put forth by the FDA. GRAS substances can be used in food under specified conditions as long as the safety of the substance can be validated. Do insects meet GRAS requirements? Insects have been consumed for food throughout human history. There are also experts in the science community that promote the wholesomeness of insects as food. There are no known hazards associated with consuming insects except for allergies. Domestically farming insects using good manufacturing practices will reduce or eliminate the risk of common hazards such as pesticide residue. I do not agree with Edible insects: future prospects for food and feed security’s interpretation that insects are additives. Insects used in food are GRAS and therefore do not default to a food additive status. Additives require premarket approval. Commonly consumed edible insect in the US such as meal worms, crickets and wax worms should be considered GRAS. FDA approval of GRAS substances is not required before using them in food. There is a GRAS notification program to notify the FDA of a substance but it is not necessary. The program either confirms your determination or disagrees. Article: Is the GRAS Process Broken? This entry was posted in Business, Regulations and tagged edible insects, fda, Food Safety, GRAS on March 1, 2014 by Bob.